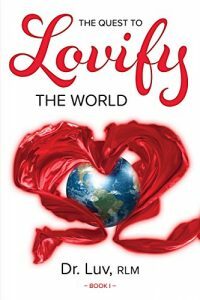 Laurie Huston from News the Heart is talking with Author, Dr Luv on his The Quest to Lovify the World – Luvffirmations to change the World. Dr Luv invites us to Open our Hearts and Change the World through ForGiveness, Luvffirmations and Visualizations. This endearing little story gets to the Heart of what matters and reminds us how Simple our Purpose and Journey is. Let’s Love On! We discussed the main themes of the story from ForGiveness, Luvffirmations, cancer, Love Switches, Everything happens for a reason, Bigger Pictures, Fireflies vs cockroaches and his game Synchrohearts. Join us for this fascinating discussion! We’re Getting to the Heart of what Matters! This entry was posted in Archives and tagged Bobby O'Neal, Dr Luv, Forgiveness, Laurie Huston, Lovify the World, Luvffirmations, News for the Heart, News for the Heart Radio, Synchrohearts. Bookmark the permalink.